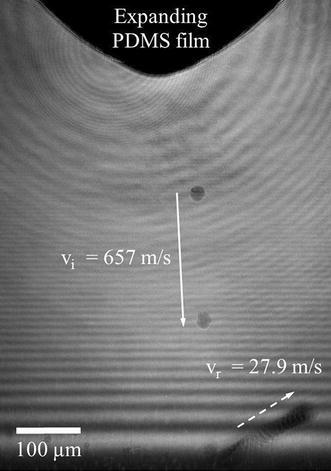 Impact of spherical particles onto a flat sapphire surface was investigated in 50-950 m/s impact speed range experimentally and theoretically. Material parameters of the bilinear Johnson–Cook model were determined based on comparison of deformed particle shapes from experiment and simulation. Effects of high-strain-rate plastic flow, heat generation due to plasticity, material damage, interfacial friction and heat transfer were modeled. Four distinct regions were identified inside the particle by analyzing temporal variation of material flow. A relatively small volume of material near the impact zone becomes unstable due to plasticity-induced heating, accompanied by severe drop in the flow stress for impact velocity that exceeds ~ 500 m/s. Outside of this region, flow stress is reduced due to temperature effects without the instability. Load carrying capacity of the material degrades and the material expands horizontally leading to jetting. The increase in overall plastic and frictional dissipation with impact velocity was found to be inherently lower than the increase in the kinetic energy at high speeds, leading to the instability. This work introduces a novel method to characterize HSR (109 s−1) material properties and also explains coupling between HSR material behavior and mechanics that lead to extreme deformation.